Defective Products | Eduardo De La Cruz-Munoz P.A. When consumers purchase a product, they have the right to assume that said product is safe and poses no threat to their immediate safety or health. However, some products may be manufactured improperly, labeled incorrectly, or be poorly designed in a way that could be harmful to its consumer. At the Law Office of Eduardo de la Cruz Muñoz, P.A., we will challenge corporations and manufacturers, not only to ensure you are compensated for any losses or damages associated with a defective product, but to hold them accountable for the safety of their products. Types of product liability lawsuits. The majority of car accident claims are based on negligence, or when the responsible party acted in an irresponsible or careless manner that caused injury, death, or harm to another person. In order to win a negligence lawsuit, your attorney must be able to prove that the other party acted negligently, that said negligence caused the accident, and that the accident caused your injuries or losses. If you were injured as a result of the improper or precarious design of a product, you may be eligible to file a defective design claim to receive the compensation you deserve. 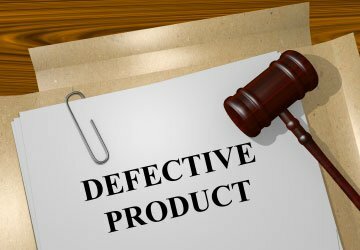 If you or a loved one was injured by a defective product due to a flaw in its manufacturing, the company or its manufacturer may be held accountable.